I always enjoy looking through the Beverage Dynamics archive – 80 years of magazines provides a fantastic overview of the beverage alcohol industry. The features and advertisements reflect the cultural norms, lingo and historical events that took place during each era of our industry’s growth. In this inaugural post, I’m looking at three advertisements from the January/February 1991 issue from 25 years ago. Tanqueray Sterling, Cactus Juice and Kamora Coffee Liqueur (all of which are still available) were very young brands, fighting for shelf space at retail. 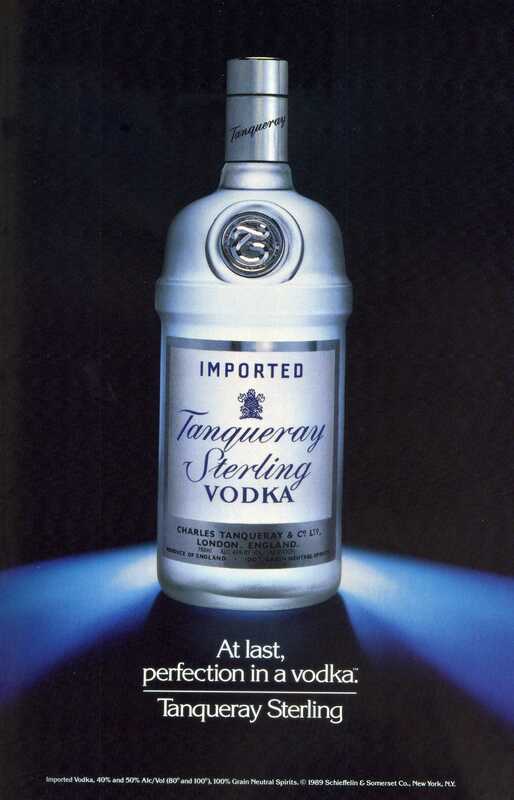 According to the Jobson’s Liquor Handbook (a precursor to today’s Beverage Information & Insight Group’s Liquor Handbook), in 1991 Tanqueray Sterling spent $1.9 million in advertising (magazines, newspapers and outdoor ads, since there was no TV advertising at the time). For comparison, Absolut spent $16.7 million that year, and the entire vodka category spent $37.8 million. The dissolution of the USSR was among the major events impacting the vodka market, causing consumption to fall from 35.4 million 9-liter cases in 1990 to 33.4 million in 1991. By 2014, the vodka category had grown to more than 72 million cases sold. At last, perfection in a vodka. Tanqueray Sterling. Imported vodka, 40% and 50% Alc/Vol (80 proof and 100 proof), 100% Grain Neutral Spirits. Copyright Schieffelin & Somerset Co., New York, N.Y. 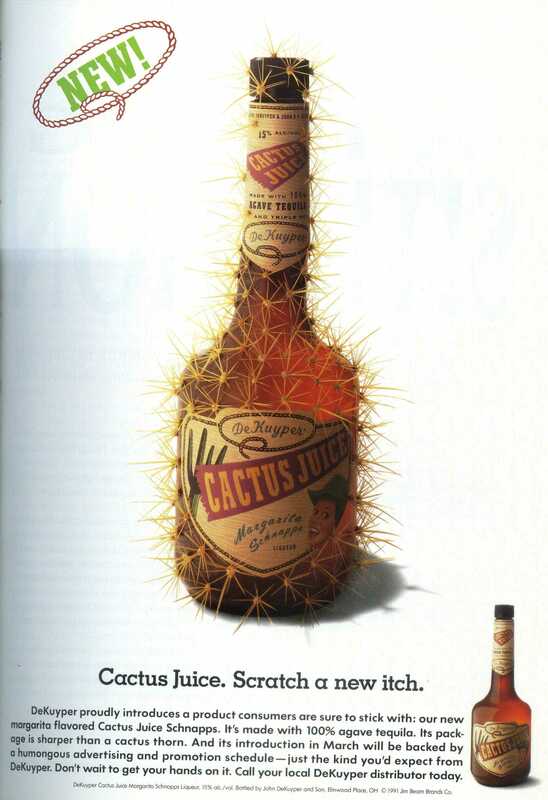 In 1991, Cactus Juice contributed to DeKuyper’s 2.29 million case sales, though the line experienced a slight decline to 2.25 million cases in 1992. In 2014, DeKuyper sold 2.18 million 9-liter cases. Total consumption for the Cordials & Liqueurs category fell from 17.6 million cases in 1990 to 16.3 million in 1991, holding flat in 1992. By 2014, Cordial & Liqueur sales had risen to 23.6 million cases, with Fireball leading the category. Cactus Juice. Scratch a new itch. DeKuyper proudly introduces a product consumers are sure to stick with: our new margarita flavored Cactus Juice Schnapps. It’s made with 100% agave tequila. Its package is sharper than a cactus thorn. And its introduction in March will be backed by a humongous advertising and promotion schedule – just the kind you’d expect from DeKuyper. Don’t wait to get your hands on it. Call your local DeKuyper distributor today. DeKuyper Cactus Juice Margarita Schnapps Liqueur, 15% alc/vol. Bottled at John DeKuyper and Son, Elmwood Place, OH. Copyright 1995 Jim Beam Brands Co. 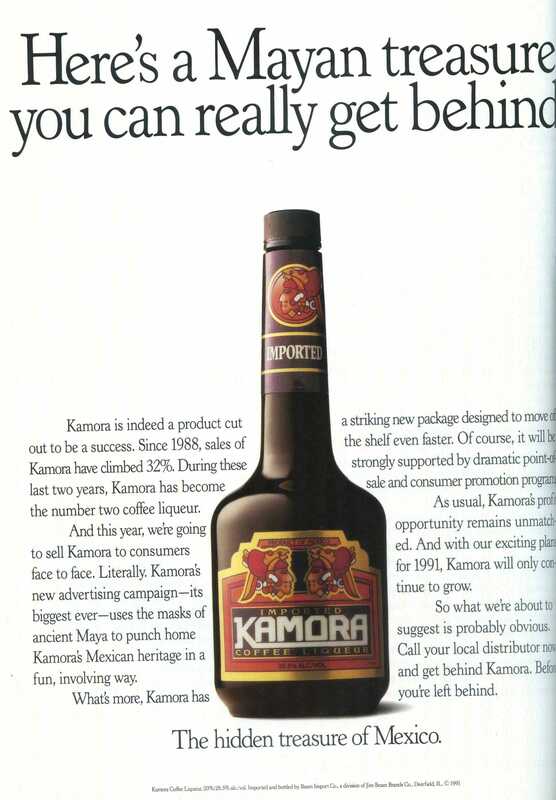 In 1991, Kamora Coffee Liqueur was the #6 advertiser in the Cordials & Liqueurs category, spending $1.8 million. In 1992, that number would rise to $2.7 million as the brand continued to grow. It sold fewer than 210,000 cases in 1991 (data is only available for the top 10 brands in the category), and in 2014 the Beam Suntory brand sold 149,000 cases, making it the #3 coffee liqueur behind Kahlua and Patron XO Cafe. For comparison, Kahlua sold 852,000 cases in 2014 and 1.45 million in 1991. Here’s a Mayan treasure you can really get behind. Kamora is indeed a product cut out to be a success. Since 1988, sales of Kamora have climbed 32%. During these last two years, Kamora has become the number two coffee liqueur. And this year, we’re going to sell Kamora to consumers face to face. Literally, Kamora’s new advertising campaign – its biggest ever – uses the masks of ancient Maya to punch home Kamora’s Mexican heritage in a fun, involving way. What’s more, Kamora has a striking new package designed to move off the shelf even faster. Of course, it will be strongly supported by dramatic point-of-sale and consumer promotion programs. As usual, Kamora’s profit opportunity remains unmatched. And with our exciting plans for 1991, Kamora will only continue to grow. So what we’re about to suggest is probably obvious. Call your local distributor now and get behind Kamora. Before you’re left behind. The hidden treasure of Mexico. For more historical data and analysis, visit The Beverage Information Group’s research page at www.albevresearch.com.